It’s the greatest thrash album to ever emerge from the UK and one of the finest thrash albums in existence, regardless of bloody geography! Frankly, there are too few superlatives to convey the true majesty of Britain’s finest ever thrash album. 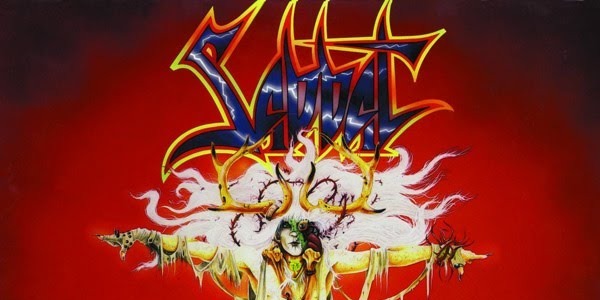 Sabbat were one of the most unique bands in thrash history and although short-lived, their overall contribution to the scene remains unparalleled. Propelled by the ingenious riffs of producer extraordinaire Andy Sneap (Arch Enemy, Nevermore, Teastament) and Martin Walkyier’s uniquely unfettered and untameable vocals, Sabbat’s philosophically pagan take on religion was ground-breakingly raw and real; an honest summation of the world and it’s failings. The opening tracks, “A Cautionary Tale”, “Hosanna In Excelsis” & Behind The Crooked Cross” are exemplary, an unholy triumvirate of trailblazing thrash that perfectly encapsulated Sabbat’s religion-baiting sound. However, it was the intelligence on display that truly ranked them as one of the genre’s greats; here was poetry set to furious thrash, the likes of which has never been seen again. History Of A Time To Come is mandatory listening for every thrasher on the planet and has barely aged; its place in the thrash history books permanently set in stone! A reformation between 2006-2010 sadly yielded no new material but Sabbat’s legacy stands strong. Liked that? Try this: Sabbat’s equally accomplished sophomore release, the undeniably astounding Dreamweaver (1989). 6 more undervalued classics of German thrash to be devoured! God save our noble THRASH! UK Thrashers Suicide Watch Unveil Some Actual News! Some actual, real news from UK thrashers Suicide Watch!